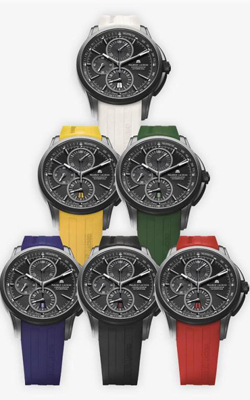 Olympic novelty Maurice Lacroix - Watches Pontos The Olympians. The world's attention these days focused on London and passing it to the Olympics. The world’s attention these days focused on London and passing it to the Olympics. Quite naturally, and the world watch industry did not remain aloof from this great event. And the company Maurice Lacroix – not the first dedicates its products to the London Games. New company – a collection of Pontos The Olympians, retaining the characteristic features chronograph Pontos: false temporary indexes and hands coated with phosphor coating on the black dial. 30-minute and 12-hour counters are located at positions “1” and “6”, respectively. Second dial located at the position of “9” hours, and the aperture of the date – the position of “6” hours. On the flange located tachometer scale. Watch case is made of stainless steel with black PVD coating. The basis of new products – the mechanism Valjoux 7750. However, the distinguishing feature of the new collection – this is not a technical component of the clock, it is – a bright rubber strap. And in the end, it should be noted, a remarkable thing: each model is dedicated to the collection of certain Greek god. 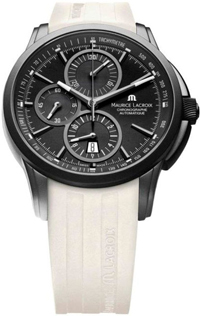 You can buy watches from authorized representatives of the company Maurice Lacroix.